Vacuuming your stairs can be more than a little bit annoying unless you have the right equipment for the job The best thing you can do to make it less painful is use the best vacuums for stairs. We researched the best-selling and top-rated handheld vacuum for stairs to put together these reviews for you. But before we get started, let’s look at our vacuum buying guide to make sure you know what features to look for. Power: There are plenty of battery-powered and corded options here. Each has their pros and cons but it really boils down to you and what you prefer. Waiting for a battery to charge can be annoying but so can worrying about a cord. 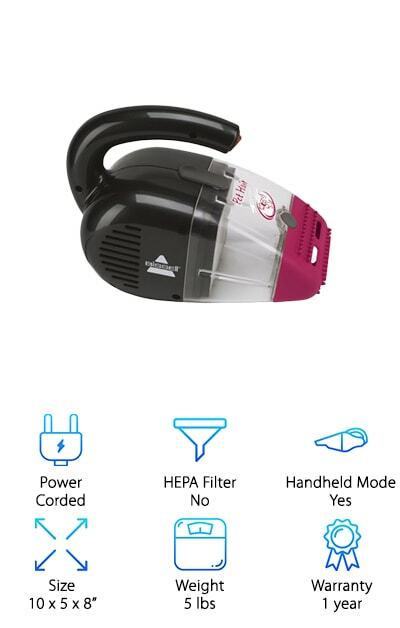 HEPA Filter: HEPA filters keep particles of dust, allergens, and bacteria from being released back into the air of your home after they’ve already been sucked up by your vacuum. They’re a good idea for a home with pets and young children. Handheld Mode: Lugging an upright vacuum up and down the stairs is no fun. There is one convenient way to clean your stairs: use a handheld vacuum. That’s why every single one of our picks has a handheld mode. Size: This is the size of the whole vacuum so if it seems a little big, no worries. A lot of our picks are uprights that have a removable handheld part for you to use on your stairs. Weight: If you’re looking for something that you can easily carry up and down your stairs, weight is obviously really important. All of these are really lightweight and they range from 2.1 to 6.77 pounds. Warranty: We love a good warranty, especially for things like vacuums with a lot of components. All of these have a warranty of at least 1 year. Make sure you know what is covered under your warranty and, more importantly, what isn’t. Now that you know the features to look for in the best vacuum for stairs, let’s move right into our reviews. Here’s the deal: our top and budget picks are right at the top of the list. That’s the best place to start if you’re in a hurry because it gives you a really good idea of what’s out there. Keep reading to the end of our vacuum reviews if you can, all of these products are awesome. Okay, let’s go! Our top pick is also the best cordless vacuum for stairs. It’s cordless so, obviously, it runs on a battery. We were pretty impressed by the battery life. 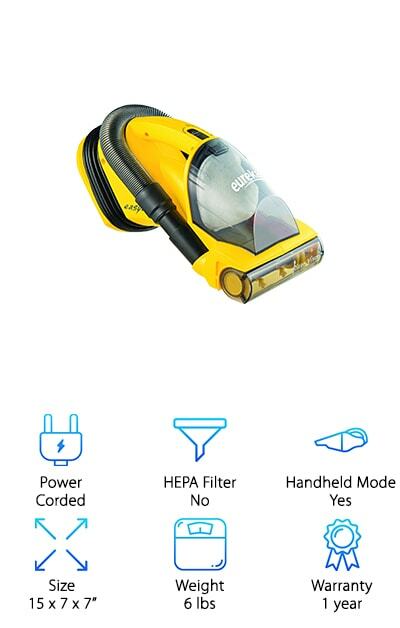 You get up to 20 minutes of continuous suction when the battery is fully charged! 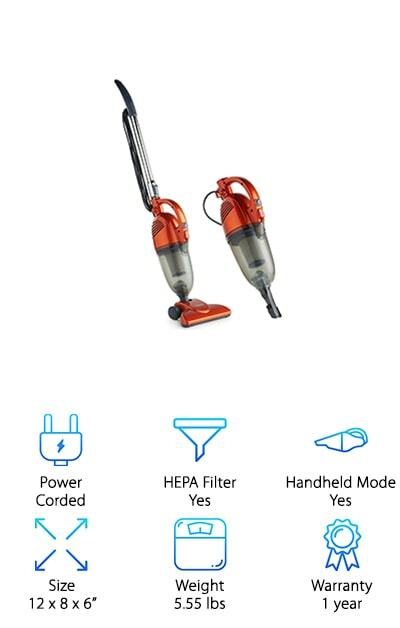 This is a bar vacuum that also has a really convenient and effective handheld mode that makes it super easy to get into those nooks and crannies on your stairs. There’s a special direct-drive cleaner that drives the bristles deep into the carpet to get out more dirt. There’s also a mini-attachment tool that’s great for getting up pet hair or any ground-in dirt. And get this: it comes with a docking station so it will always be handy whenever you need it. The Eureka EasyClean is the best vacuum cleaner for stairs for the money. 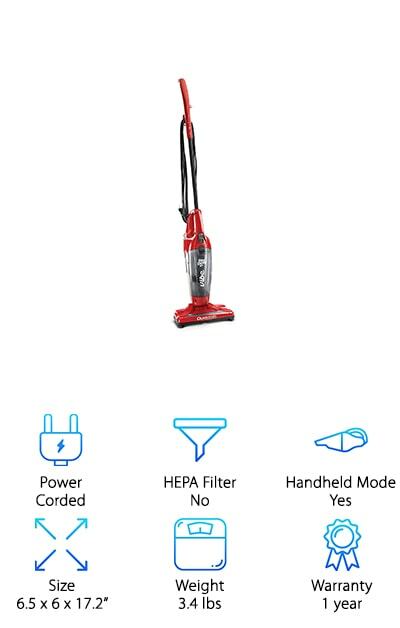 If you’re not a fan of battery powered vacuums, you’ll be happy with the 20-foot long power cord on this one. Another great thing about the cord? It’s easily wrapped around the vacuum for easy storage. This vacuum is pretty powerful even though it only weighs 6 pounds. While it’s perfect for stairs, it also comes in handy when you’re cleaning the inside of your car or when it’s time to clean sofas and recliners. There’s even a crevice tool that attaches to the end of the hose to help you get all those though to reach places. And get this: it has 2 motors! One of them powers the suction and the other the revolving brush. If you’re looking for the best vacuum for stairs and pet hair, check out this one from Bissell. That’s literally its name, the Pet Hair Eraser Vacuum. Here’s how it works. There’s a special rubber nozzle on the front of the vacuum that’s great at attracting dog hair and at getting out ground-in dirt. 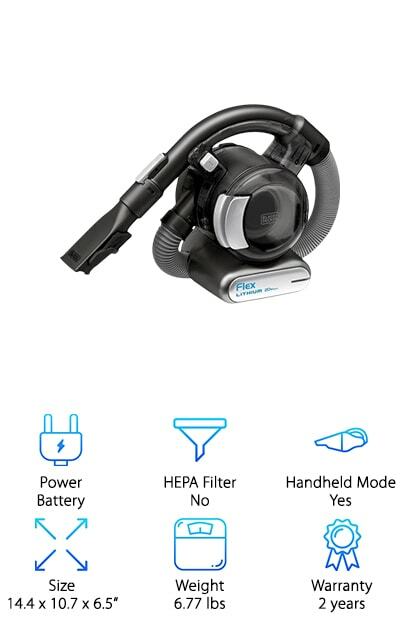 The Cyclonic Cleaning System helps create a powerful suction to make sure the pet hair gets sucked into the bagless collection cup. It also comes with a smaller contour nozzle that gets into the tight corners on your stairs in the creases in your furniture. It’s super lightweight, too, at only 5 pounds so carrying it up and down your stairs or from room to room shouldn’t be a problem. Plus, it comes with a 1-year warranty. One of the reasons we’re calling this vacuum from VonHaus the best vacuum for carpeted stairs is because it’s 2 in 1 feature makes it so versatile, you’ll want to use it all over your house. One of the best things about it is that is has a HEPA filter that will trap small particles and prevent the spread of allergies and even bacteria. If you have a pet, a HEPA filter is a great thing to have, especially if you also have young children. And guess what else? It’s also really effective on hardwood floors. 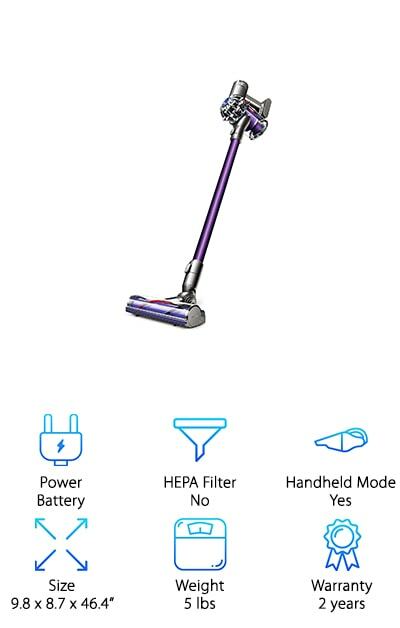 This vacuum has just about everything. 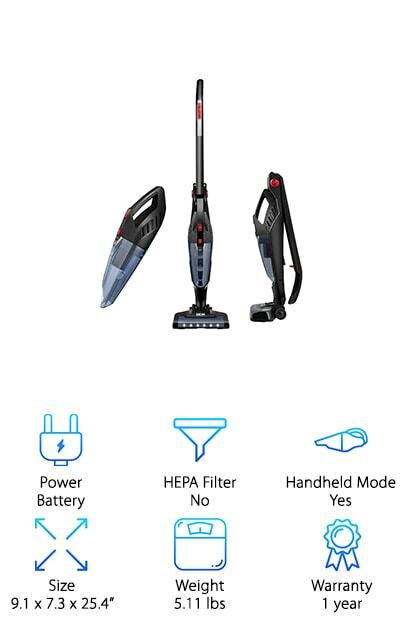 A handheld mode and reliable suction that’s great for your stairs plus an upright mode that can clean almost any flooring surface you might have. One of the things to keep in mind about the best handheld vacuum for stairs is that they’re also pretty great when you use them on other parts of your home. What do we mean? This Dirt Devil Vibe is a great example. It has an awesome 3-in-1 design that’s perfect for stairs. It has a handheld mode, it’s lightweight, and it even has a few attachments you can use to make sure you get into all the little corners. Plus, it’s a great upright that you can use on any flooring surface. There’s a brush roll attachment with an “on” switch for vacuuming carpets and an “off” switch to use on your hardwood flooring. Plus, it’s bagless. Emptying the dirt collection cup is easy and mess-free. When it comes to the best vacuum cleaners for stairs, this one from Black and Decker is unique. For one thing, it just looks different from most of the other products we reviewed. It’s powerful, versatile, and even cordless. Get this: it comes with 3 different attachments. You can use a 4-foot extendable hose, a stick vacuum attachment with a pivoting floor head, or a pet brush attachment. 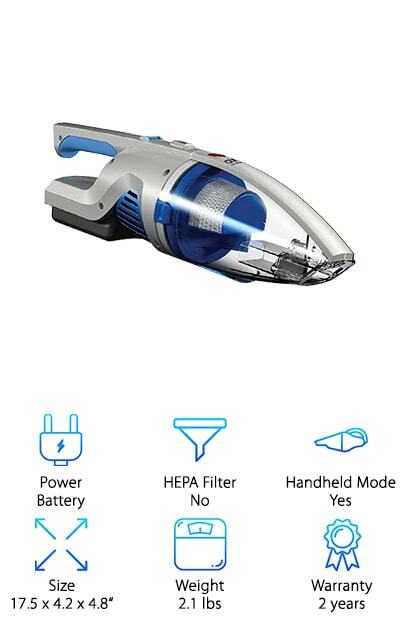 It’s a handheld vacuum that can do just about anything even though it only weighs a little more than 6.5 pounds and is surprising compact. It comes with a convenient charging dock that will get the battery fully ready to go in 4 hours. There’s no bag, either, just empty the no-mess collection container directly into the trash. This best stair vacuum comes from Deik and it’s pretty remarkable. What do we mean by that? For one thing, it’s a powerful and effective handheld stair vacuum. It weighs just a little more than 5 pounds and you won’t have any problem carrying it up and down your stairs. You can also use it as stick vacuum. It’s really easy to move around thanks to the 180 degree steering head. The handle even folds down for easy storage. Maintenance is easy, just remove the dust collection container and empty it right into the trash. 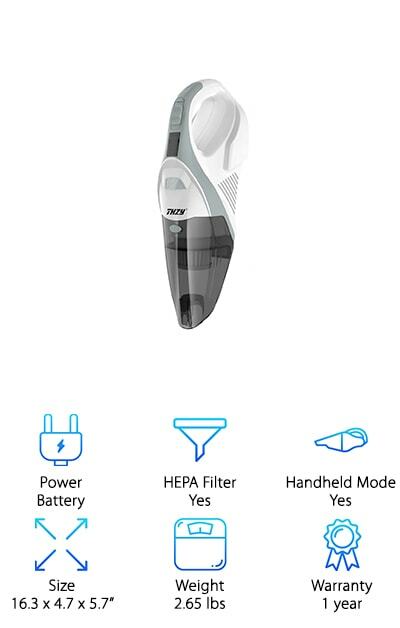 This one is cordless and a full charge will give you about 30 minutes of continuous cleaning. It comes with some extras, too: a crevice nozzle, dusting brush, and a 1-year warranty. One of the reasons this Shark vacuum for stairs is also the best vacuum for stairs and carpet is because it’s so lightweight. Believe it or not, this machine weighs less than 4 pounds! The 15-foot long power cord means you’ll never have to wait for a battery to charge again and gives you the freedom to clean your stairs from top to bottom without having to unplug. The suction is really powerful plus the motorized brush gives your carpet a nice, deep clean. Clean-up is easy, too. Because it’s bagless, emptying is as easy as removing the collection cup directly into the trash. In addition to the brush, you’ll also get a crevice tool and dusting brush to clean everything from stairs to your car interior. The best small vacuum for stairs comes from a name you can trust, Hoover. 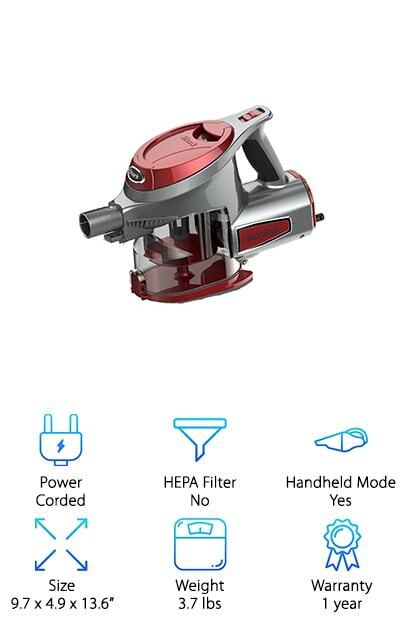 This bagless handheld vacuum runs on a powerful lithium-ion battery. And get this: the power never fades. It’s just as powerful the first time you use it as it is at the end of its life. Something we have to point out about this vacuum is that it’s the lightest one we found in our research. It weighs just over 2 pounds so if you’ve been looking for something that’s super lightweight, here it is! It also comes with a reusable filter that just needs to be cleaned under running water occasionally. It’s perfect for cleaning around furniture legs, in between couch cushions, and, yes, even the tight corners on the stairs. Last on our list for best hand vacuum for stairs is this awesome vacuum from THZY. For one thing, it has strong cyclonic suction that makes it a good vacuum for stairs. Plus, it’s really lightweight at just over 2.5 pounds. It’s cordless so you can take it just about anywhere: up the stairs, down the stairs, even out to your car. Plus, you get 25 minutes of cleaning from a full charge. One thing we really like it the built in LED light. You can see what you’re missing when you’re cleaning the dark corners of your car or underneath your furniture. Another really great thing about this best vacuums for stairs is that it has a HEPA filter that’s washable and reusable.